This premixed Matcha blend consists of Grade 1 Organic Matcha green tea picked during the first harvest, combined with natural raspberry flavour and cane sugar. Matcha tea is prized for it’s wide range of health benefits, and contains naturally occurring vitamins, minerals and antioxidants which can all contribute to overall wellness and mental well being. Our Raspberry Matcha Grade 1 is pre sweetened with natural cane sugar, and contains no artificial colourings, preservatives or chemical additives. Naturally organic, it is a top quality Raspberry Matcha blend that is not only delicious but good for you too! Tasting Notes: Immediate raspberry taste with a wonderful green tea sweetness to the finish. 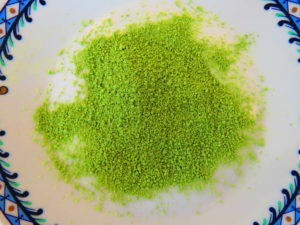 Ingredients: 1st grade Matcha Powder, natural raspberry flavour, cane sugar.